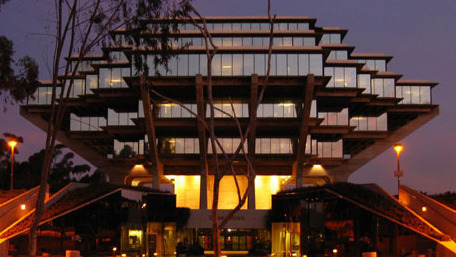 Geisel Library courtesy of Wikimedia Commons. A National Institutes of Health program to consolidate the massive amount of scattered biomedical research data will include the UCSD School of Medicine, which received a $9.2 million grant, UC San Diego announced Friday. The NIH announced its initiative Thursday, saying a dozen centers for data would be created around the U.S. The Scripps Research Institute and the Scripps Translational Science Institute, both based in La Jolla, said they would take part in a center to be established at UCLA. In Friday’s announcement, UCSD said it would take part in a center being formed at the University of Texas Health Science Center in Houston. A UCSD-led team plans to develop a strategy for cataloging and indexing biomedical datasets, coined “big data” because of the volume, variety and speed at which information — anything from whole genome sequencing to social media tweets — is being collected in the digital era. Dataset indexing is considered a vital step toward being able to build a searchable online digital library. The project, called “BioCADDIE,” is a derivative of library science, so UCSD researchers will collaborate with biomedical librarians who have expertise in cataloging and indexing digital publications. In Thursday’s announcement, TSRI said it was awarded a $3.8 million, four-year grant, while $600,000 will go to the STSI, which is a collaboration between TSRI and Scripps Health that works in the field of genomics.